Checker is played on the same board as Chess, consisting of the same 64 dark and light squares in alternation on a square board. The checker piece is round and easy to move. But the most unique of all checker pieces is the wooden one. Wooden checker pieces are haunted by many people, especially the giant one. Beside durable for outdoor use, it also beautiful for decoration at garden. Interesting to wood checker pieces? We have lots of different wood checker pieces, in painted, varnished, and finishes. This set is constructed of the best quality of Teak wood, carved by our professional craftsman and polished well in black and brown. 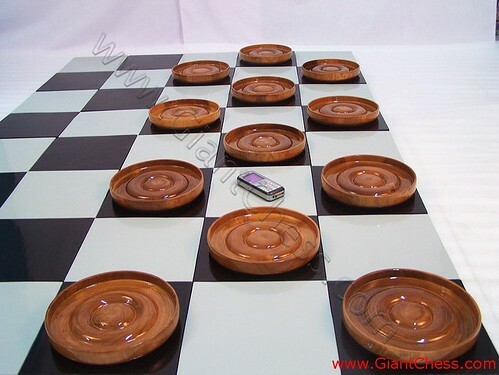 Increase the joy of playing board games with our checker pieces that are beautifully designed and will make excellent gifts for friendly competition.